Following the Longhorns on their quest for Quidditch glory in "Aggieland"!!! Quidditch is a fictional sport developed by J. K. Rowling for the Harry Potter book series. It is described as an extremely rough but very popular semi-contact sport and has now been adapted for muggles (non-magical people). Matches are played between two teams of seven players running with broomsticks, using four balls and six elevated ring-shaped goals. The sport can best be described as a mixture of football, rugby, basketball, and dodgeball combined into one action packed game. The Intercollegiate Quidditch Association (left) started in 2005 as an intramural league at Middlebury College in Vermont. The rules were adapted from JK Rowling's Harry Potter novels by Alexander Manshel, the first Quidditch Commissioner, so muggles (non-magical people) could play without flying on brooms. 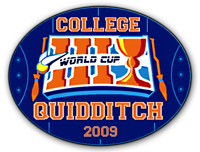 The first Intercollegiate Quidditch match was between Middlebury College and Vassar College on Nov. 11th, 2007. Since then, more than 200 institutions from around the world have joined the league. The vast majority are based in the US, and are divided among five regions: The Northeast, Southeast, Midwest, Southwest, and Northwest. Other countries with teams or leagues that play by the IQA rules include Canada, Mexico, Argentina, England, Iceland, France, Israel and Australia. Additionally, dozens of High Schools around the world have started playing by official IQA rules as well. There is now an annual Quidditch World Cup held in Middlebury and last year 16 teams from all across the US and Canada competed. Quidditch spread to The University of Texas in 2009 when Aaron Rodriguez and Alexandra Young co-founded the Texas quidditch group. The recent Texas A&M Quidditch tournament in April was the first ever competition for this young Texas team and the first of its kind in the Southwest! Saturday April 24th, 2010, the Texas Longhorns competed in the first ever quidditch tournament in the Southwest! Teams from Texas, Texas Tech, LSU, and host team Texas A&M all fought for quidditch glory. This site was a collective effort by Kurt Mitschke, Doug Luippold, Donnie Hogan and Wes Hamilton. Not familiar with the rules of Quidditch or how the game is played? Not to worry, neither were we. This site explains the game of quidditch while also showing how much fun it can be! How familiar are you with Quidditch?